Transesophageal echocardiography (TEE) is a test that allows your doctor to record images of your heart from inside your esophagus, or food pipe. These images help your doctor identify and treat problems such as infection, disease, or defects in your heart’s walls or valves. Allow 1–2 hours from your arrival to the time you can leave. 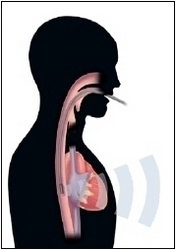 A probe in your esophagus sends sound waves. Mention all the medications you take and ask if it’s okay to take them before the test. Don’t eat or drink for 6–8 hours before the test. This includes water. Tell your doctor if you have ulcers, a hiatal hernia, or problems swallowing. Also, let him or her know of any allergies to any medications or sedatives. Arrange to have someone drive you home after the exam. When you arrive for your TEE, you will change into a hospital gown, and then be taken to the testing room. Your throat is sprayed with an anesthetic to numb it. You may be given a mild sedative through an IV (intravenous) line in your arm to help you relax. You may also be given oxygen. Then you’ll be asked to lie on your left side. The doctor gently inserts the probe into your mouth. As you swallow, the tube is slowly guided into your esophagus. The tube is lubricated to make it slide easily. You may feel the doctor moving the probe, but it shouldn’t hurt or interfere with your breathing. A nurse monitors your heart rate, blood pressure, and breathing. The test usually takes 20–40 minutes. You can eat and drink again when your throat is no longer numb. Be sure to keep your follow-up appointment.